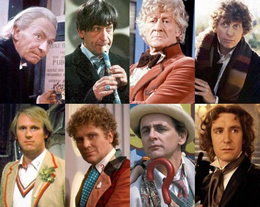 Performers include: William Hartnell, Patrick Troughton, Jon Pertwee, Tom Baker, Peter Davison, Colin Baker, Sylvester McCoy, Paul McGann, Carole Ann Ford, Jacqueline Hill, William Russell, Maureen O’Brien, Peter Purves, Adrienne Hill, Jean Marsh, Jackie Lane, Anneke Wills, Michael Craze, Anneke Wills, Frazer Hines, Hamish Wilson, Deborah Watling, Wendy Padbury, Katy Manning, Elisabeth Sladen, Ian Marter, Louise Jameson, John Leeson, Mary Tamm, Lalla Ward, Matthew Waterhouse, Sarah Sutton, Janet Fielding, Mark Strickson, Gerald Flood, Nicola Bryant, and Bonnie Langford. A mysterious time-traveler, The Doctor, and his companions explore time and space while solving problems and righting wrongs. They travel in an unreliable old time machine known as the TARDIS (Time And Relative Dimension In Space). It’s much larger on the inside but, due to a chronic malfunction, its exterior is stuck in the shape of a 1950s British police box. The Doctor frequently clashes with villains like Davros and his mutant creations known as the Daleks who seek to “exterminate” all in their path. As a Time Lord, the Doctor is able to regenerate his body whenever he is near death (providing a convenient way to recast the actor when needed) and the new incarnations each have their own quirks and abilities. Following the end of the series, the Doctor returned in a 1996 film and then, in a new series in 2005. More about: Doctor Who (1963), Doctor Who (1963): canceled or renewed? This has probably been asked before, but why do you describe Doctor Who’s 20th and 21st century incarnations as distinct series? Given that the shows have been produced and broadcast by the same broadcaster since 1963, and retain the same continuity (such as it is) in its characters, surely it’s not just because they opted to describe the show’s 27th season as “Series 1” in 2005? As I recall, their calling it “series one” was part of the reason. When they were describing the new series, it also seemed more like a reboot than a revival at the time.